AMD's roadmap for the next two years has leaked, and it's filled with information about what the company is planning for their desktop and mobile CPU and APU lines. While 2015 will see a mix of 32, 28 and 20nm chips, 2016 is the year AMD will finally move to a newer, 14nm manufacturing process. At the top of the product stack is a new flagship processor, which will finally replace AMD's aging 32nm Piledriver-based FX CPUs. This new 14nm performance chip is codenamed 'Summit Ridge', features up to eight Zen CPU cores without an integrated GPU, and will utilize AMD's upcoming FM3 socket when it launches in 2016. Also using the FM3 socket is AMD's upcoming range of mainstream desktop APUs, codenamed 'Bristol Ridge'. Like Summit Ridge, these mainstream APUs are set to launch in 2016, and feature up to four Zen CPU cores. However, as these chips are APUs rather than CPUs, they will come with integrated next-gen GCN graphics and technologies such as TrueAudio and AMD's Secure Processor. Bristol Ridge is also seen at the top of AMD's mobile APU line-up, with a targeted TDP of 15-35W. A similar product, 'Basilisk', will be available for small form factor desktops and low-power mobile products, featuring two Zen CPU cores and largely the same feature set as Bristol Ridge. At the bottom of the stack is AMD's ultra-low power parts, codenamed 'Amur' and 'Styx'. Amur will launch in 2015 as a 2W 20nm SoC with up to four ARM Cortex A57 CPU cores and GCN graphics; while Styx is scheduled for 2016 with two custom-made K12 ARM cores and next-gen GCN graphics. 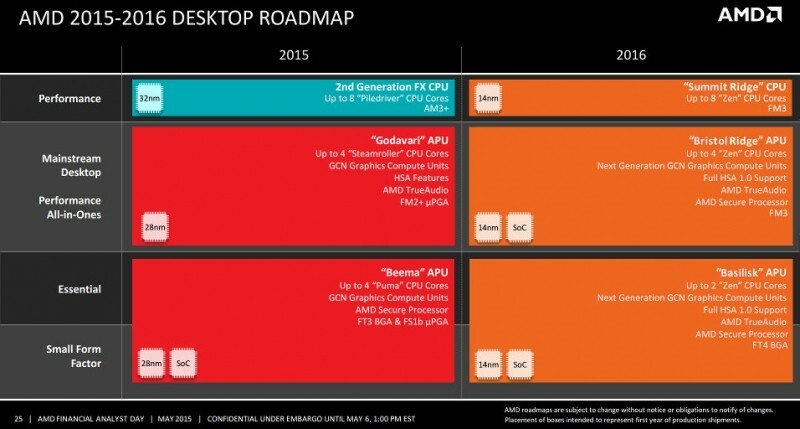 If the leaked roadmap is correct, 2016 will be a massive year for AMD. The launch of a new flagship part to compete with Intel's performance chips is long overdue, and it could well live up to expectations when produced on a 14nm node. All of AMD's upcoming 14nm APUs also sound quite compelling, especially as they support HSA 1.0 and feature brand new Zen cores. Expect more information on AMD's plans for the next two years at their financial analyst's day, which is scheduled for May 6.